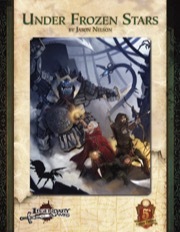 "Under Frozen Stars" is a 5th Edition adventure for 8th-level characters, which can be dropped into any campaign where the heroes are exploring the frozen reaches beyond the end of civilization, whether high atop an inaccessible mountain range or at the farthest polar reaches at the top of the world, especially if your campaign bridges traditional western fantasy with the mysteries of the far east. It is a classic lost city where magic and technologies ancient and alien lie buried in the ice, forgotten by the world beyond but still filled with mechanical marvels and deadly dangers your players will never forget. Take your 5E campaign to the ends of the earth and beyond!